With the high turnover of milk, many supermarkets are now using roll in type fridge cabinets with removable fronts or similar, in the sales area. To suit these we have a heavy duty platform which fits the base of the standard crates used. The dolly is available in galvanised mild steel and also in stainless steel. It is manufactured from 1.6mm thick material and is fully welded. The dolly is available in 2 tray sizes, 695x1050mm and 695x695mm with a 10mm edge to contain the base of the milk crate and also to catch spills from leaking containers. It is designed to take six or four standard crates to each layer and the 100mm deep base section is fitted with four heavy duty 125mm swivel castors (two fixed and two swivel castors can be fitted if requested). The side of the base is drilled and reinforced to take a "T" handle (TSS/061) to assist with moving the dollys without the need to bend down. The timber dolly consists of a panel of 17mm structural ply with 4 swivel 75mm castors attached. The ply is drilled and counter bored in the four corners to take "Tee Nuts". The castors are then bolted on from the other side. This ensures there are no projections at the top and the large flat plate of the Tee Nut gives maximum spread of the load to prevent the bolts pulling through the timber. The edge of the timber is chamfered to reduce the chance of splinters. The board is 900mm x 500mm and stands 125mm high. 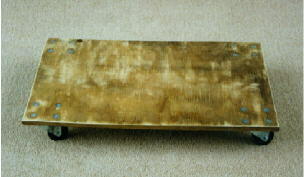 This construction makes a strong, flat surface which can easily be placed under furniture such as desks, cupboards etc. to allow them to be easily moved. If required, the dolly can be fitted with larger castors; however, the standard castors keep the profile low but still gives a capacity of around 300Kg.